Early indications are that restored U.S. sanctions on Iran are causing real pain for the ruling regime. But the efficacy of these restrictive measures has rarely been contentious. A more pressing question is, what's the end game? Will the regime negotiate at its weakest point, or continue its current behavior? One thing is clear: The status quo is untenable. The Iranian economy is infested with corruption and has been so terribly mismanaged that an array of crises - unemployment, inflation, currency devaluation, poverty – have become existential threats to the entire socio-political order. Strategically, it is difficult to conceive of a scenario where so corrupt a dictatorship can continue to ward off a disaffected, impoverished population that has almost doubled in a few short years. Perhaps the most telling indicator that the mullahs are in trouble is that the central question has boiled down to "can the regime survive?" A day before the sanctions officially took effect, the regime’s Supreme Leader Ali Khamenei tried to infuse false hope of "America in decline" into his waning loyalists: "Today, the U.S. is considerably weaker than it was forty years ago," Khamenei told the increasingly demoralized Bassij and Revolutionary Guards forces essential for suppression of discontent. Mashhad Friday prayer leader, Ahmad Alamolhoda, threatened on November 2, "If a drop of Iranian oil is prevented from being exported, then ... on the day of our choosing, we can confiscate three Saudi oil tankers; we would seize the oil and take the personnel hostage." He also threatened to launch missile strikes against several airports in Persian Gulf states. Such flailing about is consistent with a weakening regime under siege on multiple fronts. Serious objective troubles are coupled with equally significant consternation about the future. The circumstances will hardly revert back to what they were prior to the uprisings ongoing since December 2017. And there is ample evidence that the protests, as the defining feature of the domestic landscape, will continue to chip away at the regime's power. Strikes and protests by thousands of workers at Haft Tapeh sugarcane factory in Shush and steel workers in Ahvaz continued for several despite the arrest of more than a dozen workers. And tens of thousands of truck drivers resumed the fifth round of their strike, joined by thousands of farmers in Isfahan. On August 3, Khamenei acknowledged that “we have problems," while assuring an unconvinced audience that "we are not at a dead-end." Posturing aside, it is increasingly evident that the theocracy is at a strategic dead-end, because it is fundamentally not just unwilling, but also unable to resolve the multitude of crises closing in. Moreover, the economic, international, and socio-political crises arising from four decades of malign management are not trivial irritants whose consequences can be strategically tolerated. True, the suppressive forces are well-resourced and omnipresent. But history has taught us that when foundational challenges inevitably trigger public rage, a ruling structure dependent on repression will prove incapable of squelching public outbursts. At the right moment, such conditions can bring down any dictatorship. So, can the regime elect to renegotiate with the U.S? No, partly because Khamenei has equated even the promotion of such ideas to "treason," and partly because it would mean fundamental, enduring change in behavior and strategic orientation. The reverberations would be catastrophic inside the Revolutionary Guards and other instruments of repression, which means they would be too vulnerable in the face of popular uprisings. And that, in and of itself, would lead to collapse. The uprisings have had a lasting detrimental impact on the regime's equilibrium. Responding to a question about the possibility of regime change, Tehran’s president pointed to the main opposition, the Mujahedin-e Khalq (PMOI/MEK), which has been instrumental in creating "resistance units" that lead, organize and sustain protests. Hassan Rouhani said, "Remarks [about regime change] emerge from a handful of people in the U.S. who are engaged with a bunch of terrorists ... the MEK." They also “emerge” from the European Parliament, in a statement issued this month by 150 MEPs. The promise of renegotiation is fading fast. 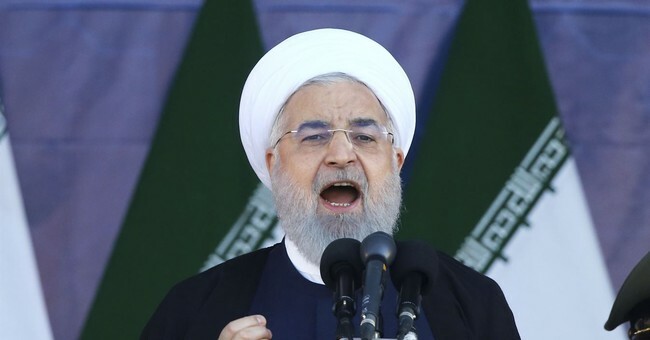 Rouhani has described the toughening of U.S. Iran policy as a function of the Iranian people’s discontent and spreading protests, acknowledging that the uprising in December 2017 prompted the U.S. withdrawal from the Iran nuclear deal. Meanwhile, a series of recent terrorist plots uncovered in Europe and the U.S. indicate a closing of the ranks, and an increasingly aggressive posture toward the West and the Iranian people. In such circumstances, the best end game is an end to the malicious dictatorship that has consistently meddled in the region and suppressed its own citizenry. A viable, organized opposition presents the best mechanism to turn things around, to the benefit of global peace and security, an end to the human rights abuses, and a non-nuclear Iran.